My ice axe, along with my crampons, are my 2 most important tools for snow and ice travel. The ice axe helps me balance and prevent a fall. If I do fall (and I have), it can stop my fall. This is called a "self-arrest", which I practice every time I get back into the mountains. The other thing an ice axe can do (it's very versatile! ), it can be used as part of an anchor when rescuing somebody. Head - usually made of steel and featuring a pick and adze. A hole in the center is provided for attaching a wrist leash or karabiner. Pick - the toothed pointed end of the head, typically slightly curved. Used for ice-climbing and self-arresting. Adze - the flat, wide end of the head used for chopping steps in hard snow and ice. Shaft - straight or slightly angled. Mine's slightly angled at the top, so I don't knock my knuckles when front pointing (ice climbing). 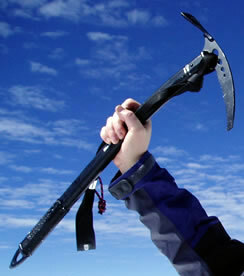 A leash attaches the ice axe to my wrist. Oh, in case you're wondering, my ice axe is a little under 60cm!